Remembering the good times spent together during the Summer season. Dad and I would go hunting, fishing, and boating and spend days together just reminiscing about the good times and the bad times. We’d talk about the families, how to know when to move forward and when to hold back, when it’s a good time to invest, and the million “what-ifs” that we all experience and wonder about. Yeah, it’s hard now and missing him more than ever. It’s been ten years now since he died and it always feels like yesterday. Sure Dad had heart trouble, his legs were getting weak, bad knees, and ailments that a lot of seniors develop. It is wasn’t until he contracted a case of whooping cough that really started the ball rolling downhill. His lungs were never the same, and then there was the pneumonia and in and out of hospitals for care. It became a domino scenario and eventually the diagnosis of C. diff. was the straw that broke the camel’s back. We know now that the body can only take so much and the infections mount and the antibiotics in every combination were not working to fight the one bug that went into the new bug that the Infection Disease docs couldn’t even identify. Super-bug haven and Dad was suffering terribly through each one. His body was unable to fight the infections any longer and we remember feeling the hopelessness, the grief, the sadness days before he died. When there’s nothing you can do to help your parent and loved one it tears you up and breaks your heart. It may be ten years but that pain – the real heart breaking pain will always be remembered and will never really go away. We get up every morning and we begin our days take care of our families, thrive the best we can knowing that today is going to be better, today we are going to be better, today we are going to be stronger than we were yesterday. Today is a gift and we have the opportunity to make it better for everyone around us, too. We can do it and we can help with sharing the information provided by the C Diff Foundation, become an active volunteer and share the brochures and literature to raise awareness. We can’t bring our loved ones back but we can sure help save lives around us. With each brochure we give out in the community and tell our stories with strangers who never heard of C. diff. or infections or how to talk with the docs about antibiotics and if it’s really necessary to take one and when we should take one — we can make a difference. There’s no better day than today to begin making a difference. It’s not all up to the government and local agencies – we live in our communities – we love our neighbors – so let’s join together and do something pro-active. Let’s remember our loved ones by doing something to help those living around us. Raising C. diff. awareness with the C Diff Foundation has found a way in my life, in my families life, and we know that by sharing shows we are caring and I know that my Dad is smiling down upon us from heaven happy that we’re trying to make a difference. Don’t get me wrong, we’ll always miss Dad, always love him and remember the good times together and no one can take that away or replace him. We just need to find an avenue to channel the energy and turn it into something positive. Being a volunteer has become our positive and we do it in our Dad’s memory. We hope to help other families from loosing their parents to this deadly infection. Thanks for letting me share my story with others who have walked this hard road and miss their Dads and Moms, too. 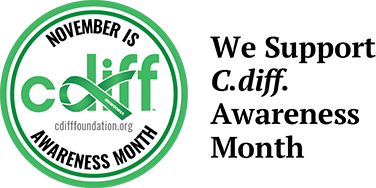 Thanks for all you do for others C Diff Foundation, thanks alot.